Shrewed is the book we've all been waiting for, a brilliant collection of essays about the lives of girls and women that is as hilarious and heart-wrenching as it is heart-warming, a book that will make you first want to call your mother, and then go out and organize a feminist parade down the middle of your street. Elizabeth Renzetti is best known for her much-loved columns in the Globe and Mail, and she's also author of the bestselling novel Based on a True Story. Here, she talks to 49th Shelf about humour, swearing, and the pleasures of reading. 49th Shelf: You write about the genesis of your book, how the idea for an essay collection came about in the aftermath of the 2016 American election. How is the finished product different from your initial vision for the collection? What parts about the process surprised you? Elizabeth Renzetti: I hope it’s funnier than I thought it would be! Those were dark days at the end of 2016. A poisonously misogynistic man had been elected to the most powerful position in the world, over a woman who had vastly more experience and intellectual ability, but who didn’t smile enough, apparently. Or possibly she smiled too much—I’ve lost track. As I wrote the essays, I realized that making myself laugh also lifted my spirits. You know that line in Arthur when Dudley Moore laughs maniacally and says, “Sometimes I just think funny things!” It was like that. Hopefully other people will think they’re funny, too. 49th Shelf: Did you write these essays differently from the way you write your weekly newspaper columns? Are essays different from columns to write? And as a writer, are you liberated or terrified by the latitude an essay affords? ER: Newspaper columns are necessarily limited by a framework: You have a certain number of words (and none of them can be profane, which is very hard for me, as anyone who’s spoken with me will know.) You want to be able to make an argument that is reasonably fresh, about a topic that is also reasonably fresh. An essay gives you much more leeway to riff, to be digressive, to trust that the reader will follow you through the maze to the centre. And you can swear a lot more. An essay gives you much more leeway to riff, to be digressive, to trust that the reader will follow you through the maze to the centre. And you can swear a lot more. 49th Shelf: Were the essays that were the most difficult to write the ones that you anticipated would be difficult to write? ER: I find it difficult to write about myself, so the ones about my personal life and family were the hardest. If you came of age in journalism at a certain time, you were definitely discouraged from writing about yourself. It was seen as somewhat cheap and flimsy. Those standards have changed, thank goodness. There’s a recognition of how powerful a personal story can be. It’s difficult to be open and vulnerable in your writing, but the rewards are immense. 49th Shelf: I continue to be struck by the generosity of your book, how much credit you give to the women you’ve learned from. In particular, you write about learning to make space for younger and different voices—one doesn't hear this often enough in feminism. What has this process been for you? What advice do you have for feminists who are struggling with it? ER: I actually don’t think it’s that hard. Read more. Listen more. Listen to people who are not like you, or who think differently. You have ten Google fingers for a reason—use them! Don’t expect women from marginalized communities to do the work for you—do it yourself. Find voices that you like and spread the word. I can’t overstate the role that reading has played in my life, as a person and a feminist. I read for pleasure and enlightenment, and I always have. 49th Shelf: I love the opening of the book, where you write about writing “lib” on a pink eraser, about the negative connotations you had with women’s liberation. I love the connection you make in this story between liberation and libraries, which is to say reading. What role has reading played in your own liberation? And also, what Canadian writers are you particularly excited about right now? ER: I can’t overstate the role that reading has played in my life, as a person and a feminist. I read for pleasure and enlightenment, and I always have. Early on, as a teenager, Margaret Laurence’s The Diviners blew me away—it was thrilling to be immersed in a woman’s story that was equally carnal and intellectual, so daring and raw at the same time. I was also, at the time, reading a lot of Judith Krantz and Shirley Conran, the great 1980s women’s commercial novels that I think are underrated for their own particular, delicious representation of female autonomy. I’m also very catholic in my tastes (though no longer Catholic), so I read everything—graphic novels, history, genre fiction, biography, politics. I have to make time to read more poetry. At the moment, I’m reading and loving Djamila Ibrahim’s collection of short stories, Things Are Good Now. I’m looking forward to reading Judy Rebick’s memoir about her life in feminism, Heroes in My Head, Lisa Gabriele’s The Winters, which is her reimagining of Rebecca, Jen Robson’s upcoming novel that takes place at the time of the Queen’s wedding, and Alicia Elliott’s book because I really like her essays. About Shrewed: Why are there so few women in politics? Why is public space, whether it’s the street or social media, still so inhospitable to women? What does Carrie Fisher have to do with Mary Wollstonecraft? And why is a wedding ceremony Satan’s playground? These are some of the questions that bestselling author and acclaimed journalist Elizabeth Renzetti examines in her new collection of essays. 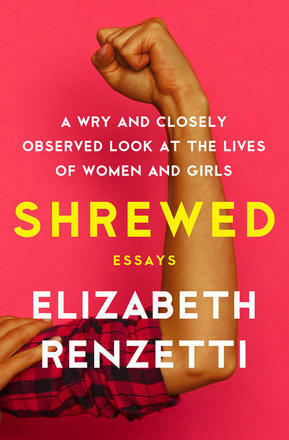 Drawing upon Renzetti’s decades of reporting on feminist issues, Shrewed is a book about feminism’s crossroads. From Hillary Clinton’s failed campaign to the quest for equal pay, from the lessons we can learn from old ladies to the future of feminism in a turbulent world, Renzetti takes a pointed, witty look at how far we’ve come—and how far we have to go.